Rejuvenator® Matting | The Rembert Company Inc.
Rejuvenator® urethane matting and flooring - is the undisputed record-holder when it comes to comfort, resilience, and long-term value. Rejuvenator® flooring, runners, and workstation mats will help your team stand stronger, longer. It delivers the ultimate combination of durability, ergonomics, and awesome good looks. Manufactured from 100% urethane, this perennial all-star features an unparalleled ten-year resilience warranty. Available in domed and square designs, as mats, connecting runners, or tiles for larger configurations. FOB Shipping Point. Workstation Mat - Great solution for workers who spend most of their shift standing at one station. Black in color. 5/8" thickness. Floor Tiles - Available in domed or squared designs. Features large 3 x 3' modules that interlock on all four sides to customize on-site any floor configuration. Black in color. 5/8" thickness. Ramps - Finish off your flooring project with beveled ramps in yellow or black. 2" wide ramps provide a visual cue and transition for on-off access and are compatible with 502 and 503 flooring tiles. 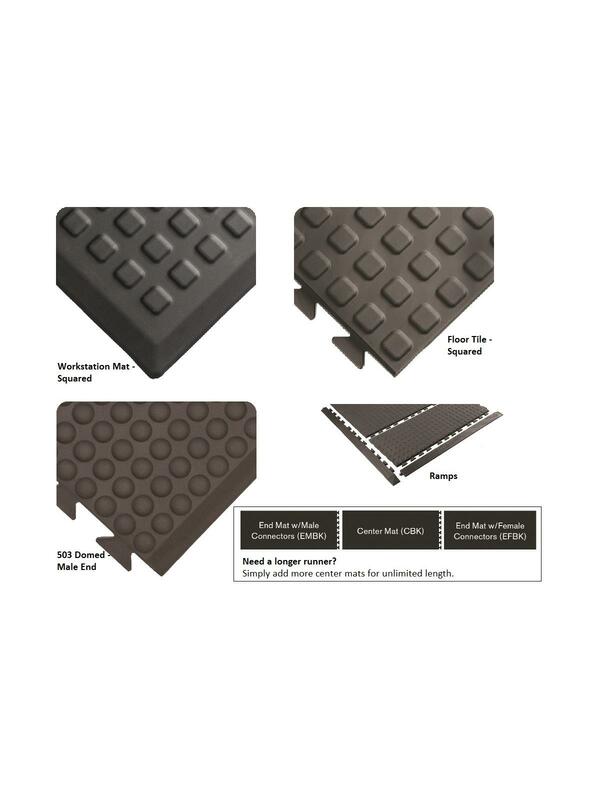 All Rejuvenator® ramps are universal to all Rejuvenator® tiles. 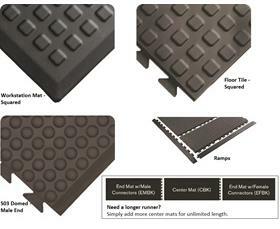 Runners - Create 2' and 3' wide runs of ergonomic matting. With a female end and a male end, all that's left is to connect as many centers as you need for your space. The molded-in ramps reduce installation time and costs. Available in domed or squared designs.